Which attractions will I be allowed on in regard to my height? PortAventura Park, Ferrari Land and PortAventura Caribe Aquatic Park have attractions that are suitable for everyone. Each theme area has at least one attraction for children, with no height restrictions. The height restrictions for each attraction are available here, in the guides at the park entrance and on the information boards at the entrance to each attraction. If I need to, is it possible to leave and re-enter the park? You are permitted to leave and re-enter the park provided that you keep hold of your ticket. You can also ask for a stamp at the park exit that you will be asked to show when you return. For further details click here to read the PortAventura World Terms and Conditions. Where can I find the park calendar? The PortAventura World calendar and opening times are available here. When is the start of the Halloween season in PortAventura Park? Halloween in PortAventura Park starts on the 21th of September and ends on the 17th of November 2019. Consult the Calendar with all opening times and information on all of our Special Events. When is the start of the Christmas season in PortAventura Park? Christmas in PortAventura Park starts on the 23th of November 2019 and ends on the 6th of January 2020. Consult the Calendar with all opening times and information on all of our Special Events. Is there an additional charge for rides and shows? There is no additional charge. Admission to the park gives visitors unlimited access to rides and attractions. On exceptional occasions, PortAventura Park may organise special events outside and within site opening hours that may or may not be included in the price of tickets and/or passes purchased to access PortAventura Park's facilities. Are children allowed to visit the park alone? From 12 years old it is possible to access PortAventura Park, Ferrari Land and PortAventura Caribe Aquatic Park without a responsible adult. For further details click here to read the PortAventura World Terms and Conditions. If it rains, does the park close and/or do we receive a refund? Rain does not affect park operations and therefore the price of admission will not be refunded. You will be able to continue enjoying the shows and services even if it rains. Although strong rain, thunderstorms or gales may affect operation of some attractions, once these conditions have ceased park operations will resume as normal. For further details click here to read the PortAventura World Terms and Conditions. Is there suitable access to the attractions for people with disabilities? For visitors who meet both conditions of at least 33% recognised disability and accreditation of reduced mobility, PortAventura World will issue a special ID allowing the holder to enter attractions and shows by the Exclusive Access for people with disabilities and reduced mobility. This ID will be valid for the beneficiary and up to a maximum of 1 adult companion in the case of Shows and up to 4 companions in the case of rides, at least one of which must be an adult and capable of looking after the disabled person. Click here for full details about Special Rates. What should I do if I lose any personal property in PortAventura World? If you lose any personal property in the parks or hotels, before leaving report this to the Guest Service (at the entrance to PortAventura Park), to your hotel reception or by using the online form on our website. We will note the details of the lost property and contact you if it is found. Are pets allowed in the PortAventura World hotels? For reasons of health and hygiene animals are not permitted, with the exception of guide dogs. PortAventura World has boarding kennels where you can leave your pets if necessary. All animals must have the relevant health certifications. (Service subject to availability, payment required, restricted opening hours). 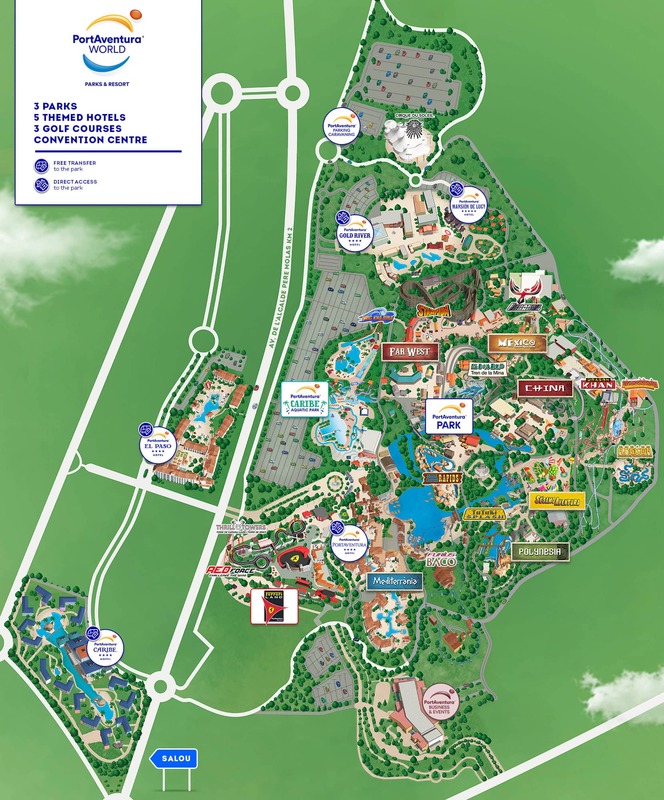 Can I leave and return to the PortAventura Park, Ferrari Land and PortAventura Caribe Aquatic Park parking areas on the same day? Of course. You can enter and leave the park whenever you choose. On your return please present your car park ticket to the admissions staff. If not coming by car, which method of transport is the best to arrive at PortAventura World? There are many different ways of travelling to PortAventura World if you don't have your own vehicle. You can arrive by train, bus, taxi or book a transfer from the airport. Click here for full details. How much time do I need for a visit to PortAventura World? Click here and we can help you to plan your visit so that you can enjoy everything that we have to offer in accordance with your personal preferences.